I suspect Julie’s Wardrobe will become a regular post in the upcoming year. Bug immediately informed me that Julie was going to need a nightgown. We sifted through the stash of leftover yarn until we found some DK weight yarn, and I started on a crocheted project. It went quickly, I started it that evening, finished at lunchtime at work, and wove in the ends as soon as I got home that night. Bug kept checking in on me to see how far I had managed to get, so I knew that I could not work on other projects until Julie had sleepwear. 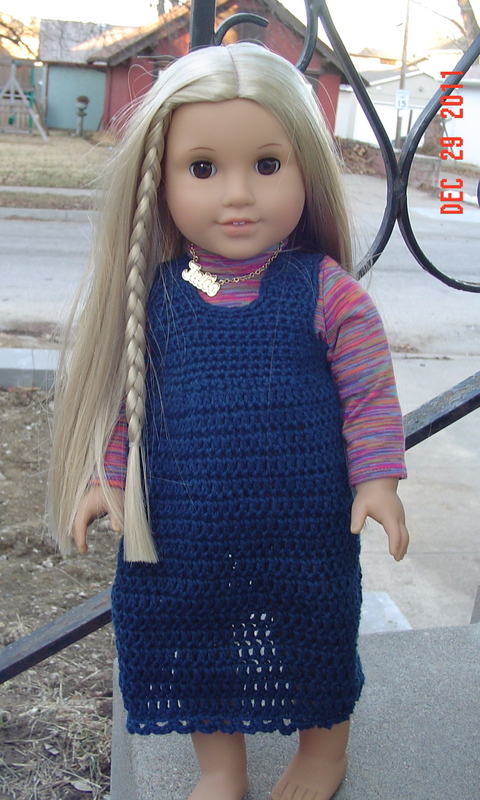 There is a corresponding robe for this pattern and I will make it, but I don’t have the yarn for it right yet. Bug doesn’t know this yet, but she still has a bed for Julie coming, and so I will be designing a missoni inspired blanket for the bed next. But I’ll keep that one secret. She really gets a giggle over secret knitting. It has been fun keeping track of my spinning and knitting this year. Even though we are not into the new year yet, I know I will not be adding to these totals. I do not add projects which have not been completed, and between now and New Year’s Eve I will not complete any more projects. So, that means my totals for the year are 18.1 miles knit, and 3.91 miles spun. Not too shabby! Next year I should add how many miles I’ve biked to the stats. My holiday break has been so productive knitting wise! I’ve enjoyed the quiet time immensely and can’t wait to complete these 2 days of work so I can have some more! While I started a few projects, I also decided finishing one that has been on the needles for awhile would make me very happy. 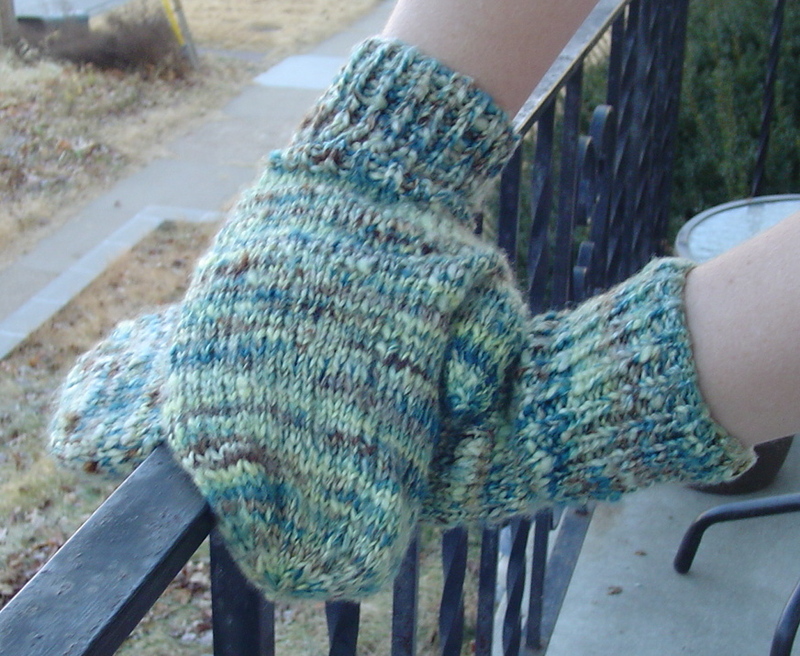 So, I finished the silk hankie mittens. I wore them this morning and they are still amazingly soft and wonderful! The biggest issue is that the silk really doesn’t have a lot of memory, so they are rather floppy soft mittens! I believe there will be a whole lot more knitting for Julie in my future. I rattled off this outfit before Christmas, with no real indication how it would fit. It looks great anyhow! Bug was very surprised I was able to “hide” my knitting from her. I found hiding the blocking far more difficult than hiding the knitting. I started a new project. Are you surprised? I think not. I’ve decided to work on a cardigan during my holiday break. I had these high hopes for working on the Vine Yoke cardigan, but in the end there were just so many issues with the pattern that I became too anxious about it, and never started. I needed another pattern for worsted weight yarn, so I took a gander through my favorites, and realized that Girl Friday has been sitting in there for a long time, but never was knit. There were a few others too, but since I am working on this as a knit along with Ummeyusuf, (as I often am!) I needed her approval too. Girl Friday suited us both. The yarn is Berrocco Lustra which I purchased some time ago at Stitches Midwest, for the Spartan Sweater that turned out to be quite a disaster. 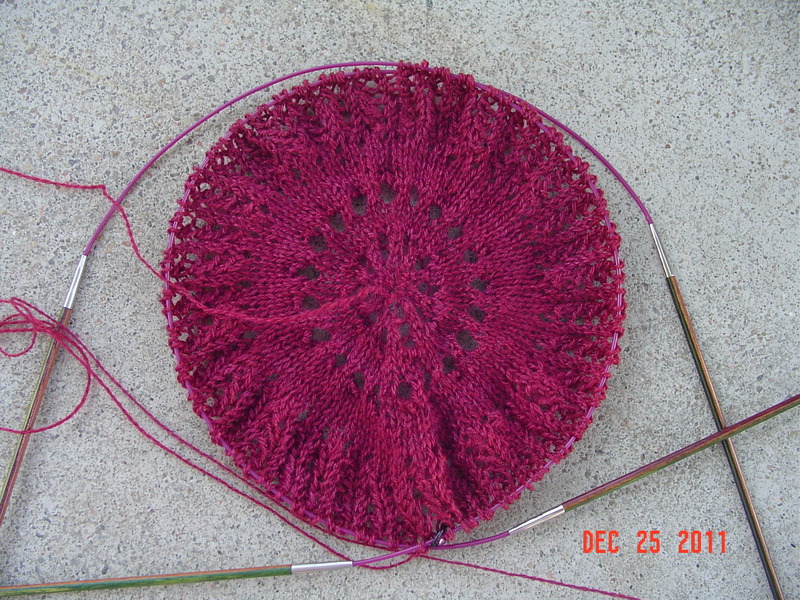 It has been frogged twice, and since it is a single ply yarn, it is a little worse for wear. However, I cannot see sitting on it in my stash or throwing it out, so I’ll give it a try anyhow. I started this Thursday evening. For the first time I am making a seamed cardigan into a full piece to avoid seaming later. It seems an easy one to do that with, so I am not too worried about messing it up. I feel like I have made a massive amount of progress in just 2 evenings, and I am sure in part this is because I am enjoying the pattern so very much. A little lace patterning always does great things for my attitude toward a knit. I may, in the end, need to purchase additional yarn as the Spartan sweater did not require very much in the way of yardage, and I would like for this knit to be nice and long. Thankfully our local yarn shop carries the yarn and has a post holiday sale going on shortly. This, of course, means I am going to have to really work hard on the sweater in order to know how much extra I will need before the sale is over! By the time the year ends, I will have knit over 18 miles of yarn in one year. This makes me feel validated in just a bit of stash acquisition, especially since I have been very very careful to not purchase yarn this year unless it was something that would be knit immediately. My friend Sarah found a way to drag me to the yarn shop, and some yarn in the sale bin which I had been resisting for a long while decided to come home with me. After all, obviously no one else wanted it! 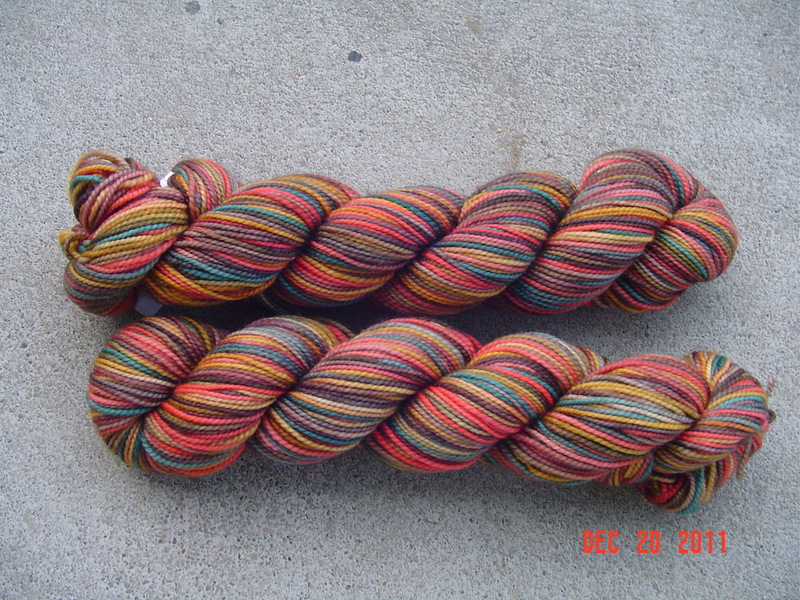 It is my favorite sock yarn, koigu. I also picked up some Noro Kureyon Sock, fell in love with the colors and I still haven’t managed to knit socks with any kureyon sock I’ve had in stash! Oddly, on comparison, it seems the above yarn and the below yarn have quite a few color tones in common. Must be my next color phase rearing its head. And finally, in a trade with Sarah, where I was required to add the fringe to a beard hat she had knit for her husband, I received 2 skeins of Regia sock which has these wonderful small stripes I fell in love with! And there you have it! I can assure you I have knit a lot more than I’ve acquired this year which is very exciting. It used to be that I’d acquire just a bit less than I’ve knit, but this year was different. Felt good! I love having a large stash, when I am feeling uninspired, just sifting through it gets the creative juices flowing. But even better is having it all documented on Ravelry, so that when I see something I want to knit, I can easily cross reference it with what I have in my stash and pick something out. Good fun!